Scratch one more off the list of "to-dos." A real fudge, candy thermometer and all, is another recipe I have been putting off for far too long. Partially because you can only eat so much fudge, but also because I was a bit intimidated by it. I have read a few horror stories about fudge and how it can go wrong. To set myself up for success I decided on an Alton Brown recipe since if there's one man who knows his cooking science, it's him. 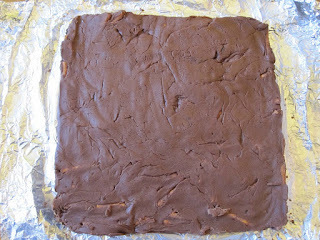 But of course, it wasn't enough of a gamble to make the fudge for Christmas, I had to go and play with the recipe too. 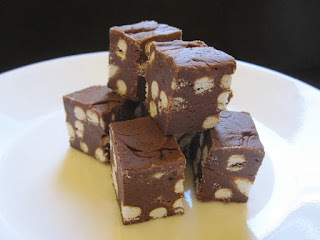 Not in any significant way, rather instead of using peanuts for the add in, I thought it would be fantastic to add salty pretzels to break up the sweetness and richness of the fudge. Now fudge is not one of those things that you can avoid making sweet. It's supposed to be sweet, and it was. Sweet and rich. But the pretzels helped to balance the sweet with salty, and the richness with their mild, light flavour. Unfortunately, the idea of having the pretzels create a variance in texture was a complete failure. Once again I was foiled by my own oversite. Without thinking, I bought pretzel sticks instead of the thicker traditional style pretzels. This coupled with the heat of the fudge caused the pretzels to become very soft. In fact, their texture was indistinguishable from the rest of the fudge. Though the rest of the fudge was soft, creamy, and smooth, so I wasn't complaining too much. Prepare an 8 inch square pan with foil and grease foil. In a medium sauce pan add chocolate, sugar, half-and-half, corn syrup, and half the butter (1 1/2 tbsp). Turn stove to medium and heat mixture, stirring with a wooden spoon until chocolate has melted. Increase heat to medium-high and bring to boil. Reduce heat to medium-low and cover. Allow mixture to boil for 3 minutes. Remove lid from pot and attach a candy thermometer. Continue to cook mixture until temperature reaches 234F. Remove from heat and immediately add remaining butter to pot. Do not stir. Allow to cool until temperature reaches 130F (the original recipe says this will take 10 minutes, it took much longer for me). Pour batter into prepared pan and allow to sit until firm. Congrats on breaking into 'real' candy making! And thanks for 'taking one for the team' by trying out the pretzels, since that is something I would totally do, given that I love sweet-salty combinations. I wonder if sprinkling the fudge with coarse sea salt or pretzel salt would have a similar effect? Actually that's exactly what I thought when you said quite a workout, haha. I'm not sure if this would help with really hot fudge, but I've tried freezing pretzels, cereals, etc. beforehand if I want them to retain their texture before mixing in with other things. @Mary -- I thought of doing something like that (originally I was going to layer the pretzels on the top or bottom of the pan), but I really wanted to try and break up the texture, and I also kind of like the idea of not tasting things in layers but being hit by it unexpectedly. Salted fudge is a great idea though, and if someone hasn't done it, you should :). @Rod -- Actually, I totally thought of that and totally forgot to mention it, Thanks! Going to update my post with the idea :). I do think it would work because by the time you add the pretzels the fudge isn't hot, just warm. I like the way your fudge looks with the pretzels. But pretzels do lose their crispiness when mixed in anything with moisture. What if you coated the broken up pretzel sticks in a melted mixture of butter and sugar, spread them on a cookie sheet, baked them, cooled them so they were like candy, and then added them to the fudge? The salt would still be there. I have a recipe for pretzel salad that calls for the candied pretzels...Or you could break down and use salted pistachios..the green might be pretty for the holidays! @Gloria -- That sounds ridiculously good. No chance I would have come up with that one :). You're some kind of evil genius :).